Congratulations! Graduating from college represents an important milestone in life and brings with it a whole new world of opportunities. It often means the start of a new job and the launch of your professional career. Dependable and reliable transportation is an important component of getting off on the right foot at any new job. That’s why Commonwealth Honda is proud to participate in the Honda College Grad program. This special program provides qualifying shoppers with $500 savings toward the purchase or lease of a new Honda from our Lawrence, MA dealership. There’s an even an option to defer your first payment for 90 days if you qualify! When you combine the Honda College Grad savings on top of our already low prices, you’ve got a combination that can’t be beat! Claiming your college rebate is easy. Just pick out the new Honda Accord, Civic, CR-V, or Pilot you want, then contact us online to let us know when you intend to claim your Honda College Grad savings. Our staff will go ahead and prepare all the necessary paperwork in order to save you time when you arrive at Commonwealth Honda for a test drive. We’re convenient to the Merrimack Valley areas with our location at 6 Commonwealth Dr, Lawrence, MA. * The Honda Graduate Program is limited to the 48 U.S. contiguous states, Alaska and Hawaii. For well-qualified customers who meet Honda Graduate Program criteria, subject to approval by Honda Financial Services (HFS). Bonus offer applies toward any new 2018 or newer model year Honda when financed or leased through HFS. Only offered at participating dealerships. 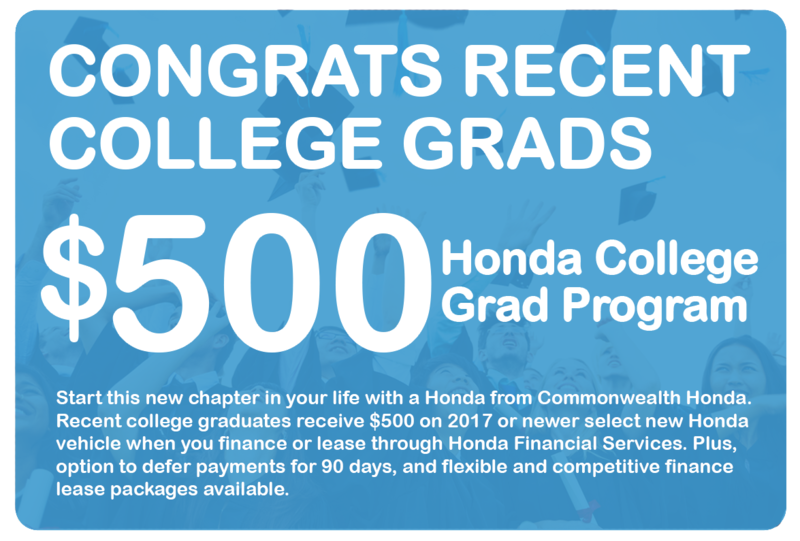 Only one $500 Honda College Graduate Bonus offer per vehicle. LEASE: $500 applied towards the cap cost of the vehicle. Monthly payment and total due at lease signing are calculated after $500 reduction. Cannot be combined with Zero Due at Signing Lease program. PURCHASE: $500 applied towards a down payment. Offer not valid on Honda Certified Pre-Owned Vehicles or used Honda vehicles. Offer valid through March 31, 2019, and may be terminated at any time. Verifiable proof of employment or a firm commitment from an employer with a start date no more than 120 days from the date of finance contract. Must have graduated in the past two years or will graduate in the next six months. No adverse credit history. Master’s, Bachelors or Associate degree from U.S.-accredited college or registered nursing school. Provide Honda dealer with credit and document requirements. Option to defer first payment 90 days (60 days interest-free) is only available with traditional financing (not leasing). Do I Qualify for the Honda College Grad Program? Must have no adverse credit history. Must have graduated in last 24 months or will graduate in next six months. Must provide Honda Cars of Boston with all requested credit and document requirements. Must have proof of employment or commitment from the employer.